The Houston Texans will be the featured team on Hard Knocks on HBO for the upcoming season. The series runs five episodes, with the first show airing the week of the opening preseason game, which for the Texans is Tuesday, Aug. 11 for the Texans before their preseason opener against San Francisco in Houston. J.J. Watt will be all over this production to be sure and I think everybody remembers how he was introduced to Hard Knocks fans when the Falcons, the 2014 featured team came to Houston for some preseason practices. Here’s the full video (NSFW – Mike Tice has a potty mouth) with Watt going up against rookie T Jake Matthews. – Arian Foster is very accommodating with the media when he wants to be – see him making the rounds at a Super Bowl or in sit-down interview with Hannah Storm – not to mention his acting career gets closer every day his NFL career gets shorter. – JaDeveon Clowney – Injury recovery, rehab have always been a part of Hard Knocks and until they capture one that hasn;t yet happened, this recovery from microfractre surgery is a big one to follow if he is back on the field during training camp. – There will be a rookie or two that they will focus on, plus the inevitable long-shot rookie, too. I’m guessing Jaelen Strong, since I imagine some focus on Andre Johnson being gong will be a storyline. I’ve produced the Bill O’Brien TV show for the past couple of seasons and in getting to see his personality a little bit, while I don’t think he’s a big fan of the intrusion of cameras and the time it will pull from him and others, I think he will be quite good on the show. When he was at Penn State in 2013, the Nittany Lions were featured on ESPN’s training days and You can get a pretty good idea of the Bill O’Brien you’ll see on Hard Knocks. Also if you’re really into seeing what O’Brien is like, here’s a huge video library from the Penn State TV crew from his time as their head coach in 2012 and 2013. Remember these fisticuffs from last year, though D.J. Swearinger is no longer a Texan. confirm that this standard is satisfied, which was done before last Sunday’s game. reviewing electronic and video information. considered all of the relevant evidence. information from any and all relevant sources and we expect full cooperation from other clubs as well. Coming off a 9-7 season under first-year head coach Bill O’Brien, the Houston Texans announced their ticket prices for the 2015 season. The Texans’ average general ticket price next season will be $91.87 per ticket, which is up 7.5 percent from $85.44 in 2014 and the first price increase since 2013. Houston’s average ticket price in 2014 ranked 15th in the NFL and the Texans anticipate their position will be comparable in 2015. The Texans have sold out 132 consecutive games at NRG Stadium, a Houston NFL record; and their 13 consecutive sold-out seasons represent the longest sellout streak of any professional sports team in Houston history. Houston’s 2015 home schedule includes the New England Patriots and Indianapolis Colts, the two teams facing off in the AFC Championship this weekend. 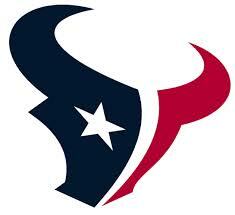 The Texans will also host the New Orleans Saints and division rivals Jacksonville and Tennessee. Additionally, the team will face Tampa Bay, the New York Jets and Kansas City at NRG Stadium. The Patriots and Colts represent the only teams that qualified for the postseason in 2014 that will visit the Texans next season.The combined record of the other six teams to play in Houston next season is 27-69. 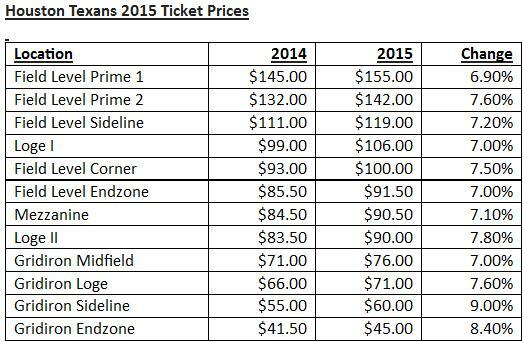 Here is the breakdown of ticket prices for the 2015 Houston Texans season at NRG stadium. While the Texans do not know who their starting quarterback will be in their final two regular season games, they know one thing. If they have any chance to make the playoffs, they must win both of their remaining games. They host Baltimore in week 16 and host Jacksonville in the finale the following week. The Ravens could clinch a playoff berth with a win over Houston (along with a few other desired results) and it also marks the return of former Texans head coach Gary Kubiak. Pittsburgh and Cincinnati could also clinch playoff berths this weekend, but we’ll look at how things must shake out for Houston to grab a wild card berth. For all week 16 playoff clinching scenarios, click here. The gist of everything to shake Houston’s way is that they need no more than one wild card team to have 10 wins, since they can no longer reach ten wins. Take a look at this playoff chart heading into week 16 that includes nine teams battling for the remaining three AFC playoff berths. The Patriots, Broncos and Colts have already clinched their respective divisions. The Texas would win all multi-team tiebreakers at 9-7. Would win win all single-team tiebreakers with every team except Pittsburgh who beat them head-to-head. BUT there are no scenarios that would leave Houston and Pittsburgh tied for the final wild card spot as the only 9-7 teams. If Houston finishes 9-7 and only one team or none from the following group reach 10 wins, then Houston will make the playoffs. San Diego and Kansas City cannot both reach 10 wins since they face each other in week 17, but a tie in that game would prevent the Texans from catching them unless both lost their week 16 games. San Diego will be underdogs in both of their games. Kansas City will be underdogs in week 16 at Pittsburgh. Buffalo is favored at 2-12 Oakland in week 16, but are at New England in week 17. The Patriots will not clinch home-field advantage throughout the AFC playoffs in week 16 unless they win and Denver loses at Cincinnati. So the Patriots could still have something significant to gain with a win over Buffalo in week 17. If Pittsburgh beats Kansas City in week 16 (and they are favored to do so in Pittsburgh), and Baltimore beats Cleveland in week 17 in Baltimore and they will be heavily favored to do so, the Texans would be eliminated. If Baltimore beats Cleveland in week 17 to reach 10 wins, then Houston needs Buffalo and Pittsburgh to finish with only 9 wins. 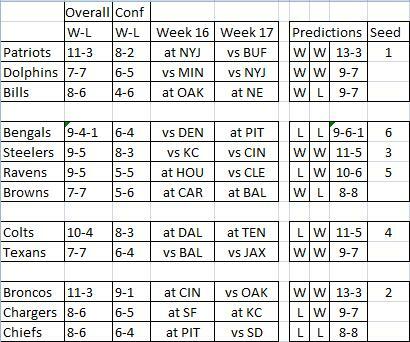 Pittsburgh would need to lose both of their games, which will be in Pittsburgh and they will be favored in both. If Pittsburgh does lose both games, that would include a loss to Kansas City in week 16. Kansas City would then need to lose in week 17 at home to San Diego. Although if Kansas City loses to San Diego in week 17, then Houston would need San Diego to have already lost at San Francisco in week 16 to keep them below 10 wins. The NFL announced the suspension for running back Adrian Peterson of six games without pay and that he will not be considered for reinstatement before April 15, 2015, for violation of the Personal Conduct Policy. This punishment is related to his discipline of his four-year old that Peterson pled no contest to reckless assault of the child in November in Montgomery County. Peterson has the right to appeal and while doing so would remain on the newly created exempt list. Within the letter sent to Peterson, commissioner Roger Goodell stipulates a lack of meaningful remorse from Peterson for his actions and Peterson’s apparent acknowledgement that he continue to discipline his children in a similar fashion. Goodell described the aggravating circumstances that led to this decision. “First, the injury was inflicted on a child who was only four years old. The difference in size and strength between you and the child is significant, and your actions clearly caused physical injury to the child. While an adult may have a number of options when confronted with abuse – to flee, to fight back, or to seek help from law enforcement – none of those options is realistically available to a four-year old child. Further, the injury inflicted on your son includes the emotional and psychological trauma to a young child who suffers criminal physical abuse at the hands of his father. Reading through the letter from the league (HERE) and considering he has already missed 10 games, with pay, this seems excessive and arbitrary, which falls right in line with what many players and their union have been saying for some time about Goodell and his recent punishments. A substantial fine, or forfeiture of wages earned while on the exempt list seem more in line with what has taken place. The letter, again, which I encourage you to read, continues with an explanation of the hearing the league attempted to have with Peterson over the last several weeks. Here is the statement Peterson released in mid-September when these allegations came to light. Here is the statement he released along with the NFL players association from earlier this week about the meeting the league was recently requesting. Run, Run, Run. Then Run Some More. Texans-49ers preview. Obviously Matt Schaub is catching tremendous heat from fans and media after throwing six interceptions in the first four games of the season. Three of them have been returned for touchdowns, including each of the last three games, two of which have been losses. As the quarterback, of course he is the focus of the ire and consternation, and in my opinion, based on his penchant for the big mistake, the anger is properly targeted. The majority of the interceptions are just flat out bad decisions. Decisions that shouldn’t be made once in a season from a 7-year starter, let alone on a weekly basis. But to blindly ignore there are not other issues with the team – specifically – the “team” of protectors in front of him, would not be right. So let’s look at something that stood out to me. Sacks. Schaub’s been sacked 11 times in four games this year. Simple math says that’d be 44 sacks over the course of the season. 44 sacks in a season would land him in the top 4 most sacked quarterbacks for each season since 2007 – his first year as an NFL starting quarterback. He’s only been sacked more than 27 times in a season once, that was in 2010, when he was dropped 32 times. Not surprisingly, the Texans went 6-10 that season, the only season since Schaub arrived that the Texans had a losing record. (To be fair, it should be noted that his individual numbers were not drastically different than his others, only slightly down. However, that 2010 defense rivaled the 2-14 (2005) Texans as the worst in team history allowing 27 points per game (29th in the NFL). I actually wanted to focus in on the 11 sacks in four games. That really stands out during his time here. Getting sacked 11 times over a four-game span has happened only two other times in his career. He’s had very good protection and an offense clearly focused on ensuring his protection throughout that time. It certainly doesn’t look like they have an offense like that this year. Schaub’s 177 pass attempts are second only to Sam Bradford’s 182. The difference is St . Louis cannot run the ball. They average just 18.3 attempts per game, which ranks 31st. They get just 47.3 yards per game on those carries which is the worst total in the NFL. The Texans are one of the league’s better running teams. They’re 12th in attempts (28.5), 7th in yards per game (134.3) and 6th in yards per carry (4.7). I asked coach Kubiak earlier this week about if they are throwing the ball too much. “If we’re not throwing it as much as we did, we’re not going to win. Obviously, in Baltimore, we got down. So we’ve been in games that have brought about us throwing the ball too much,” Kubiak said. It seems pretty clear they need to run the ball more and stick with the run more, especially if it’s as effective as it has been for more of the year. The San Francisco defense was very good in their two wins, and not real good in their two losses. They’re only 19th in the league in rushing yards allowed per game, but more importantly they are 5th in the league in rushing yards per carry, a much better measure of a defense in my opinion. Against Green Bay and St. Louis, the rushing defense was great (GB: 19-63, 3.3ypc & St.Louis: 19-18, 0.9ypc). Against Indianapolis and Seattle, their rush defense was far less effective. Seattle was credited with 47 rushes and 172 yards, which includes 2 kneel downs for -3 yards, so really it was a 45 rushes for 175 yards (3.9 ypc). Indianapolis popped San Francisco for 184 yards on 40 carries (4.6 ypc), including 9 straight runs to close out their 27-7 victory. What that says to me is run the ball. Then run it some more. 30 passes is fine for this team. 35 is fine, too. But trusting the offensive line and more importantly Schaub to throw it much more than that is too much this year in my opinion. Kubiak has had a tendency to quit on the ground game way too soon this year. I suggest he doesn’t this Sunday night. — By the way, quarterbacks are completing just 52.8% of their passes against San Francisco this year. That’s the 2nd best mark in the NFL. They’ve also allowed only 11 completions of 20 or more yards this season. Only 2 teams in the NFL have allowed fewer such completions – Seattle and…drum roll…Houston. Should be a great game. No real need to analyze what the Texans did well and what they did poorly against the Seahawks. Maybe more of that comes during the week. But for now, this game analysis is simple. They gave the game away. Plain and simple. Did not make Seattle earn the win, just gave it to them. I’ve gonna describe Seattle’s five scoring drives to illustrate the point. Seattle is a good team – the team I expect to rep the NFC in the Super Bowl – but the Texans whooped ’em up and down the field all day. But gave them gift after gift after gift and that gave the Seahawks the win. Just simply gave it to them. – Texans had 4 drives of better than 55 yards. They all came before halftime. Seattle had 1 such drive the entire game. – Texans outgained Seahawks 476-270. Texans have had the total yardage advantage in all four games. (SD 449-263, TEN 452-248, BAL 264-236). They were #1 in the league in yardage differential heading into the week and will have a sizable lead over the next best team heading into next week. – Texans have not won the turnover battle in any game this year. Dating back to last year, they haven’t won the turnover battle in six straight games. Also didn’t win the turnover battle in either of their playoff games last year. – Texans lost their first one-score game started by Schaub since 10/9/11 vs Oakland (Ironically, losing by 5 after Schaub threw an interception in the endzone on the game’s final play. Texans had won 7 straight one-score games, including their two wins this season. – Randy Bullock had 8 touchbacks on 9 kickoffs in the first two games, but missed 4 of his 5 field goal attempts. Houston went 2-0. Bullock had only 3 touchbacks on 8 kickoffs over the last two games, but made all 5 of his field goal attempts. Houston went 0-2. – Texans have the league’s number 1 ranked defense at 254.3 yards per game allowed, but are just 23rd in points per game allowed (26.3). – Texans have allowed 270 yards or fewer in all four games. They did that just 5 times last season. – Texans have not outscored their opponents in the 1st, 2nd 3rd or 4th quarter. But the have outscored their opponents in overtime, 6-3. – Andre Johnson, an absolute lead-pipe cinch to end up in the Pro Football Hall-of-Fame, leads the NFL in receptions with 34. Also has zero touchdown receptions this year (actually none in his last 6 games, just two touchdowns in his last 17 games). He’s 3rd among active players in receptions (852) and third in yards (11,622). He’s 11th in touchdowns. Kareem Jackson was one of several Texans I spoke to after the win over the Titans. I wanted you to what he said about some of the big hits in he game, because I asked him specifically about the Bernard Pollard hit that was not flagged and his hit on Kendall Wright which did draw a flag. Clearly he had an idea that maybe a fine was coming. Turns out he did get fined, $42,000 for his hit on Kendall Wright. His agent said he is appealing. Huge story in the NY Times today about ESPN pulling out of their joint project with the PBS Frontline documentary series. The story alleges that the NFL pressured ESPN to cease their involvement in the project. According to the story, ESPN & PBS had worked together for over 15 months before this recent development, which surprised PBS. Reports of a denial from the NFL also surfaced this morning. Obviously this is a developing story that clearly is a huge, ongoing issue because of current litigation and possible future litigation against the NFL for their involvement in dealing with concussions suffered by their players over the years. Here is the trailer for the two-part documentary set to debut on October 8. Watch “League of Denial: The NFL’s Concussion Crisis” preview on PBS. See more from FRONTLINE.